For Paul Kneale's show "4 or 5 self portraits for free-form natural language descriptions of image regions" at Evelyn Yard, the gallery windows have been blacked out and emblazoned with the artist's name. Approaching the space feels like walking up to a monogrammed stretch limousine where tinted windows conceal luxury objects. Surprisingly, once inside, the works look cheap and fragile. The exterior treatment of the gallery is echoed by the monochrome page design and white text of Kneale's concurrent residency on the publishing platform dreamingofstreaming.com, a visual link that reinforces the work's existence on and off-line, between different types of screen. Seven hyperlinks are listed on the website beneath the title "~~~~***PAUL KNEALE__888^NEW ABJECT___2015," taking the user to pages hosted on the classified ad site Craigslist. Together, these posts constitute Kneale's written response to Julia Kristeva's 1980 text Powers of Horror: An Essay on Abjection. For Kristeva, abjection was a state of mental and physical disgust provoked by indeterminate subject-object/self-other relations felt, for example, at the point of contact between one's lips and the skin that forms on the surface of warm milk. It was a condition, she wrote, without "a definable object." Kneale's response proposes a "new abjection”: the disgust arising from engagement with cultural products and services that have recognizably changed in the wake of Web 2.0. Paul Kneale, Late afternoon light falling on an advertisement for a non-prescription cognitive enhancement medication (2015). As much a humorous provocation as a serious argument, Kneale illustrates his concept of the "new abjection" anecdotally. In part four of his essay, for instance, the artist compares the music industry's former conversion of record sales into platinum discs with a contemporary measure of success: the number of YouTube video views. How does the subject relate to such insurmountable figures as the "1,111,658,442" recorded beneath Justin Bieber's video for "Baby," Kneale asks, calculating that, if multiplied by the duration of the video, the time taken to experience these views one after the other would require immortality and infinite battery supply. This, he asserts, is the "new abject time," in which the individual subject confronts its formation by a product used en masse. Though gallery-based work does not correspond to text in a direct, illustrative way, the parallels are often clear. Pound shop purchases, alluded to in part two of Kneale's essay, are on view downstairs at Evelyn Yard. 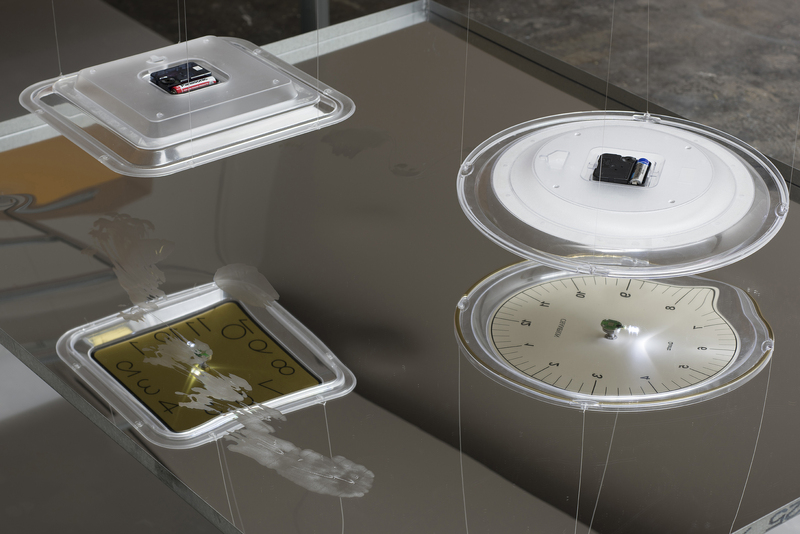 Quantum £1 shop I-V (2015) consists of an array of weightless-looking plastic clocks hovering face down, UFO-like, blinking LED light into the mirrored surfaces of five tables made from drywall frames. Meanwhile, laid on a ledge overhanging the lower space but more easily visible from the ground floor, Late afternoon rays falling on an advertisement for a non-prescription cognitive enhancement medication (2015) features photocopied marketing blurb reminiscent of Luc Besson's sci-fi film Lucy (2014). Wondering at the text's provenance, a Google search took me to cognizin.com, an operational website selling brain-boosting drugs. Another Hollywood film, Christopher Nolan's Interstellar, 2014, is evoked downstairs in the wall-mounted canvas Interstellar Crash (2015)— a digital print made from a slide capturing an open scanner's movement across glass; this is also projected onto the opposite wall as one slide in the series titled Post-post-post production (2015). Paul Kneale, Quantum £1 shop (2015). The most delightful reference to cinema comes in the work 3D lens flare (2015). 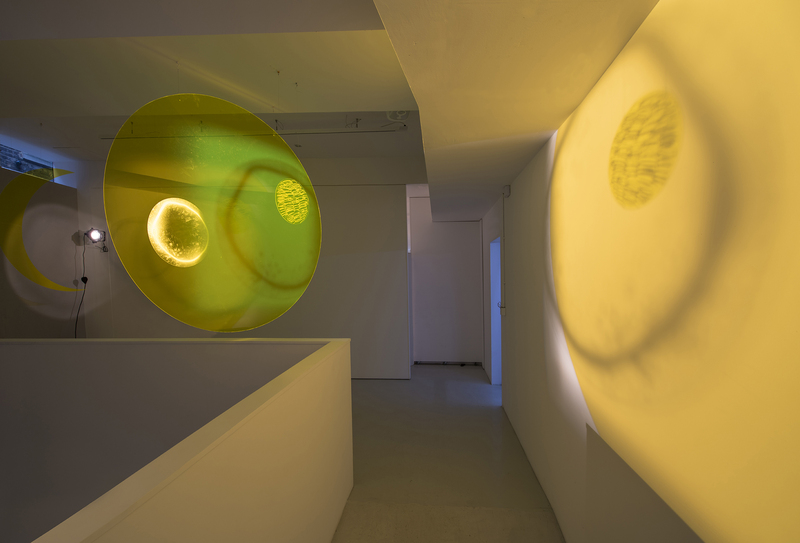 Filling the ground floor space, three yellow circles and a crescent moon cut from perspex are suspended from the ceiling, lit and aligned in such a way as to imitate the filmic effect created when light scatters inside a lens, often heightening the "realism" of a sun-drenched scene. In Kneale's essay, he points out that the lens flare effect, which is an artefact of the medium itself, takes on a corporeal quality in 3D cinema, seeming to protrude out of the screen. Highly photogenic, this piece feels like a direct response to Brian Droitcour's criticisms of postinternet as "art made for its own installation shots." 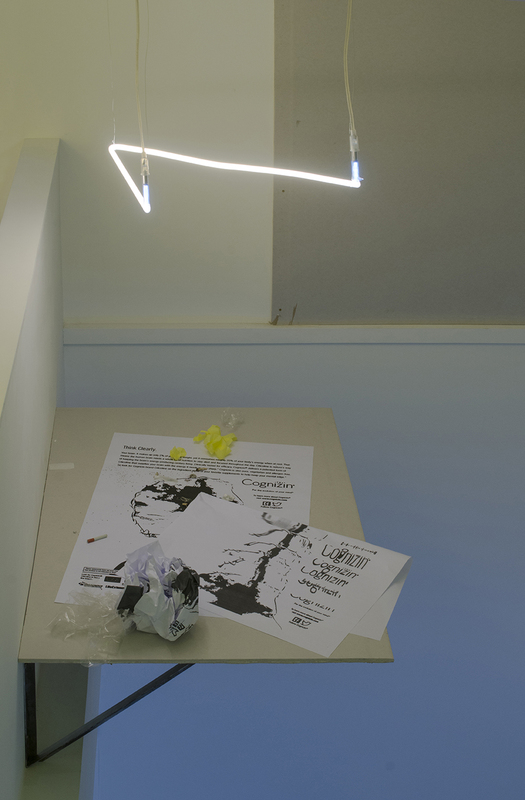 In installation shots, the three-dimensional sculpture would invite misreading as a visual artefact of the camera lens. As if to further acknowledge Droitcour's demand that "the artist does something to make the documentation strange and emphasize the difference between the work's presence online and its presence in the gallery," Kneale has photographed his exhibition and emailed the images to researchers in the early stages of developing automatic text captioning software for Google. Through this additional process, Kneale extends his continuing enquiry into feedback loops between physical works (or images thereof) and their attendant texts, and the state of human subjectivity as constructed by contemporary demands to project and receive images. 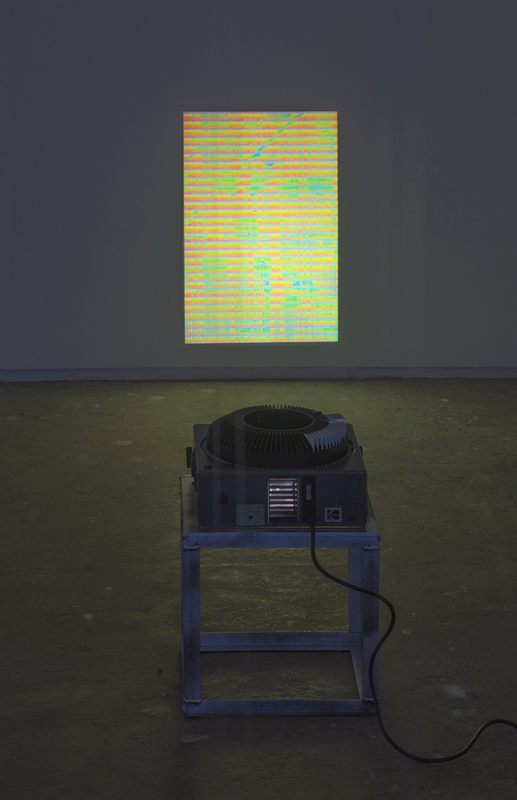 Paul Kneale, Post-post-post production (2015).